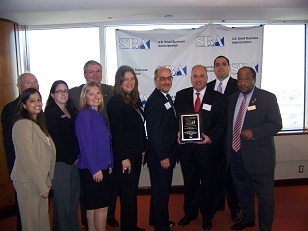 For its SBA lending efforts, Financial Resources Federal Credit Union was recently named the agencys Breakthrough Lender in New Jersey for 2011. Members of the Financial Resources FCU team received the Breakthrough Lender of the Year Award. Holding the award is Marc Sovelove, Financial Resources senior vice president of lending, with SBA District Director Alfred Titone to his right and Financial Resources CEO Lena Matthews. For its SBA lending efforts, Financial Resources Federal Credit Union was recently named the agency’s Breakthrough Lender in New Jersey for 2011.